Armored Jewels custom diamond gun sights are not only a great looking conversation piece, they are also extremely functional. Diamonds are cut with the sole purpose of maximizing the light that is returned to the eye, making them perfect for use in gun sights. These sights are very bright and draw your eyes right in on the target, especially in low light. If you are a shooter with aging eyes or a competition shooter looking for quicker sight acquisition these sights are for you. Listed below are sight sets that are sold complete and ready to install. Sight prices start at just $135. That price includes having a diamond, sapphire or ruby installed in a customer’s supplied front sight and return priority shipping. Contact us for details. Sights generally ship within 5 business days. Price includes Free Priority Shipping via USPS. To discuss the possibility of expediting your order, please call 201-874-3473. 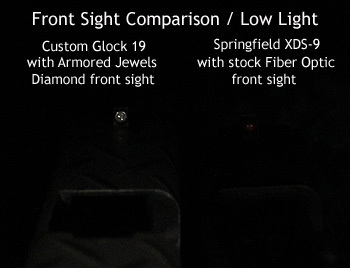 Please Note: We can make diamond sights for most handguns by request. We can also make them for long guns providing the sights are removable. Please contact us with your make and model # for a quote and current turn time. Or submit an Request / Inquiry. The price listed is for the above part #’s. Prices may vary depending on make and model. Colored diamonds are enhanced for color.